Halloween might be Wednesday, but we’re officially landing in Halloween weekend this evening! 🎃 Eeek! Don’t know what you’re wearing? No problem. 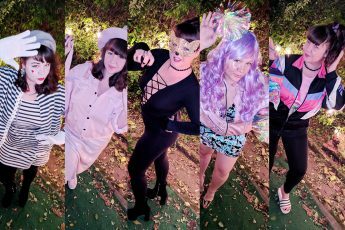 I tore through my closet and put together five fun costumes using things I already had laying around. 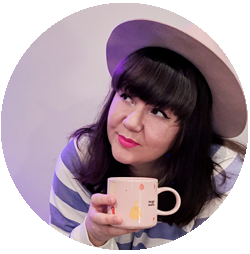 Now, some of these definitely did involve costume pieces from years past, but I’m willing to bet if you read my blog you’ve got a few random wigs, masks, and other fun things in your room, too. We’re just those kinds of gals, amirite?! I’ve noted below where I purchased things to add to the costume, along with the price, so you can see just how cheaply I put these together. 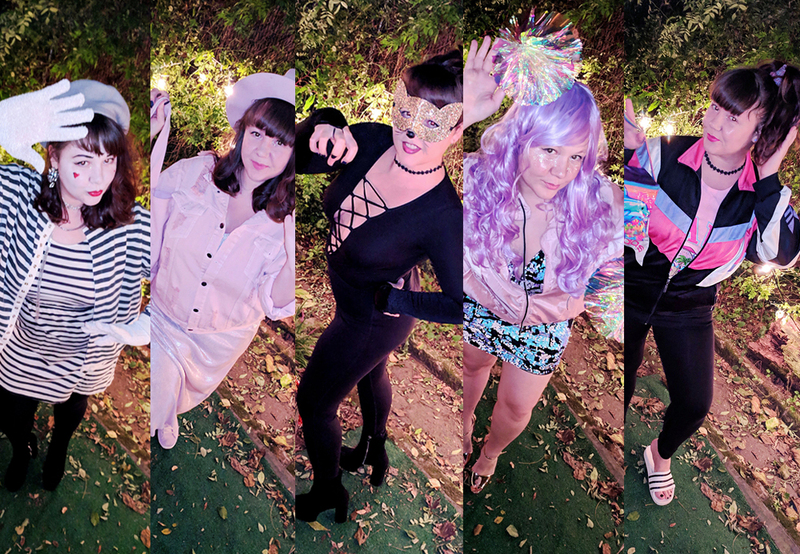 And while you might not be able to copy my costumes verbatim, I hope these will serve as inspiration for you to create your own! Ready to dive in and trick-or-treat yourself to some no-fuss costumes? 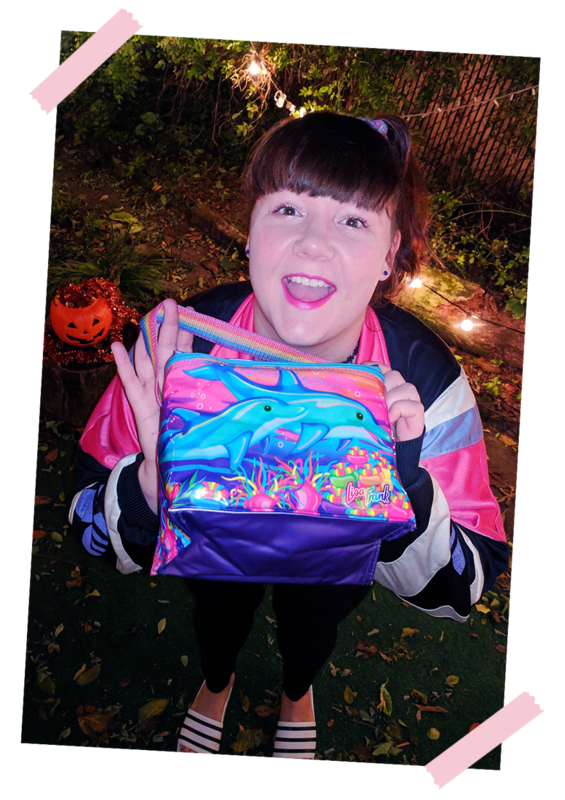 The costume: I saw a Lisa Frank lunchbox on Etsy and threw me into a whirlwind of 90s nostalgia. 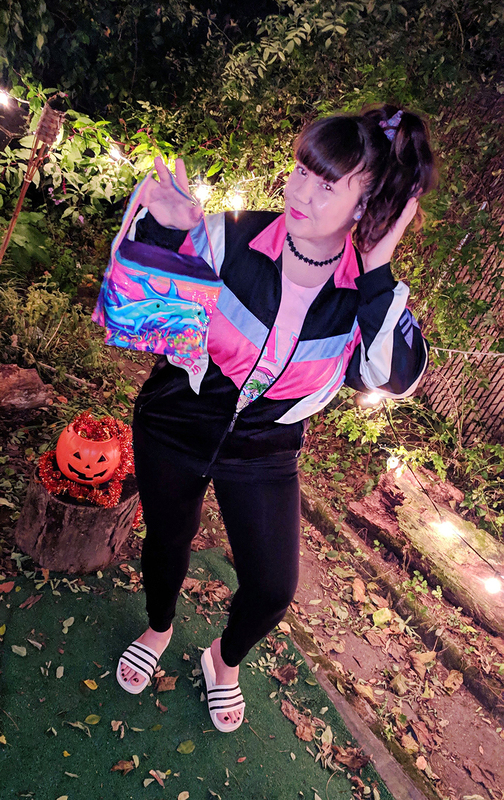 I started daydreaming about the saturated colors and fun outfits I used to rock as a ’90s kid, so I couldn’t resist bringing back the look! I happened to have purchased this vintage Adidas jacket last month—also from Etsy—which fit perfectly into the mix. Under the jacket is a 90s beach tank (shocker: also from Etsy… can you sense a theme?). The slides and leggings are newer buys, as is the “scrunchie”, which is actually a workout headband I can use later. 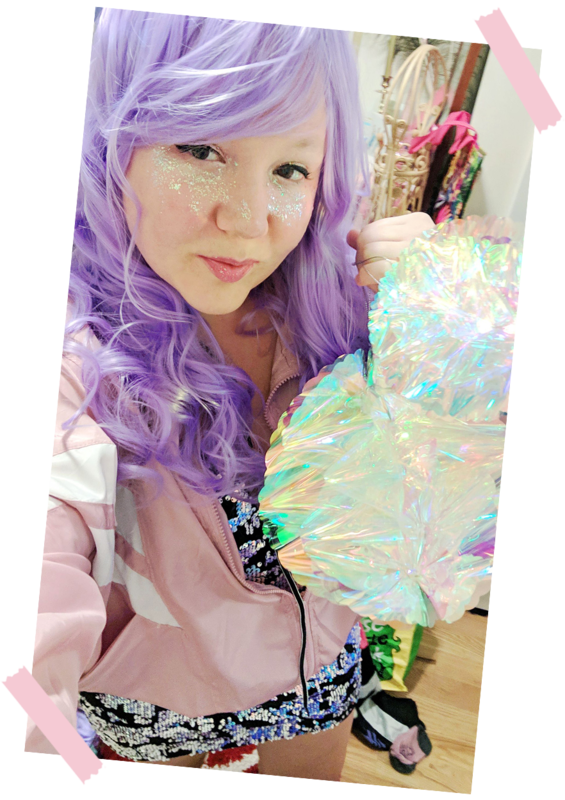 I tried not to buy anything superfluous for the sake of this post, which required some creative problem-solving for other costumes. This one was pretty easy though! *Not including the stuff I already had. The lunchbox was the big ticket item here and not really a necessary prop for a rad ’90s costume. Just think color, sporty vibes, and high ponytails! The costume: Okay, I admit it. This one isn’t that imaginative… but it’s effective! On Halloween last year—which was a Tuesday—I needed a chill costume to wear to the bar for some low key cocktails. 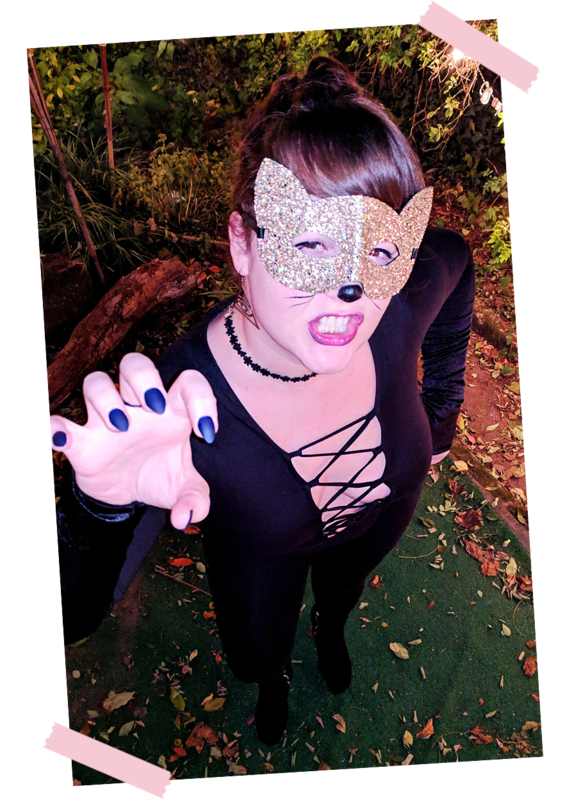 I was watching the first Halloween episode of The Office, where Pam dresses like a cute cat… and I decided to roll with it. 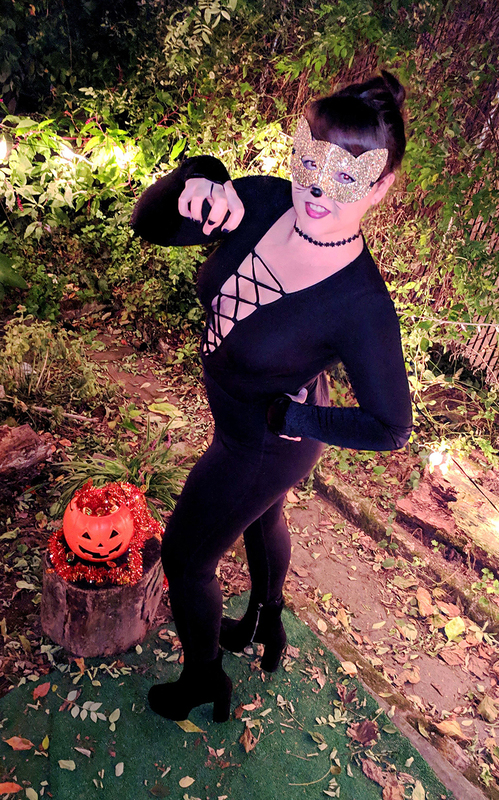 This year I had to include it in my costume lineup since I already had this mask, a Cat Woman-worthy bodysuit, and all-black-every-thing-else. For my cat nose and whiskers, I used black liquid eyeliner. I had some pointed black press-on nails laying around from my birthday, so I added those with long black gloves. *In this case, I had everything I needed already, so I didn’t spend anything extra. The costume: There are an endless plethora of cute video game babes that inspired this one, from Ulala of Space Channel 5‘s to the whole cast of Bust A Groove. I will always hold a place in my heart for games where the whole point is dancing in space while looking cute. Consider this a galactic homage that somehow came out of my closet! 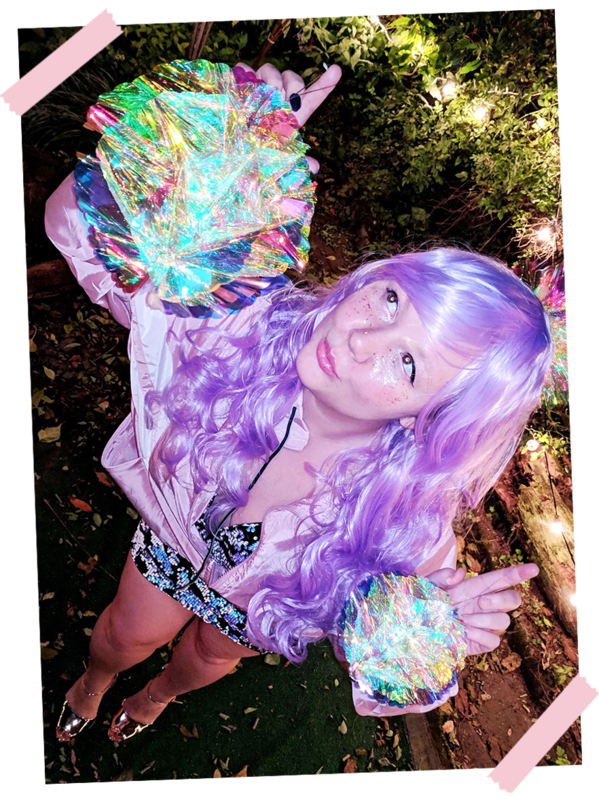 This costume is a mish-mosh of recently purchased clothing, a wig I bought for a different costume, and decorations left over from my birthday party. 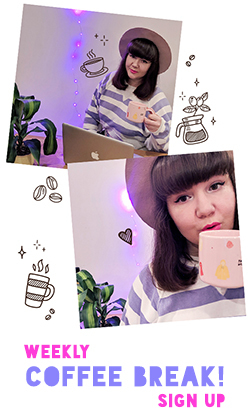 Putting it all together was an aesthetically pleasing exercise in creating a dreamy pastel palette with hints of glitter and iridescent shine. Basically, the way I wish I dressed all the time. *Just the wig! I technically did buy one accessory to make this look pop, but it didn’t arrive in time. 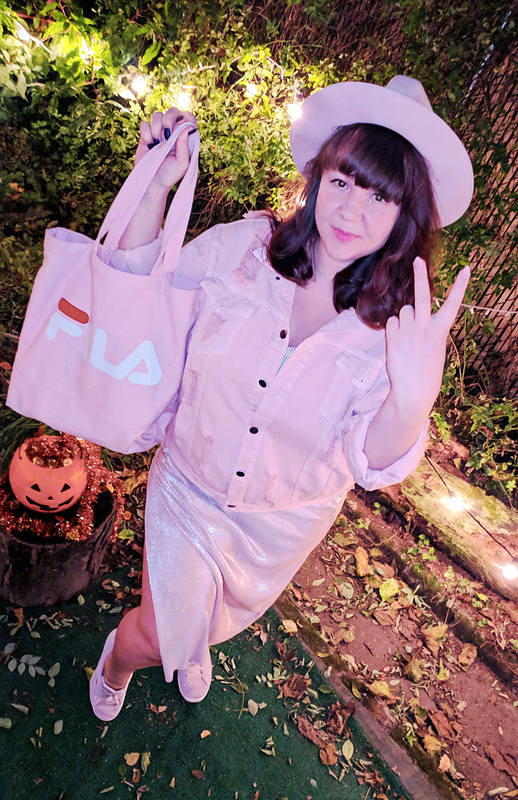 The costume: Millennial pink has been the color of the moment for a couple of years now, and it doesn’t seem to be going anywhere. This pleases me very much… because this pale, almost-mauve hue is actually my favorite color. 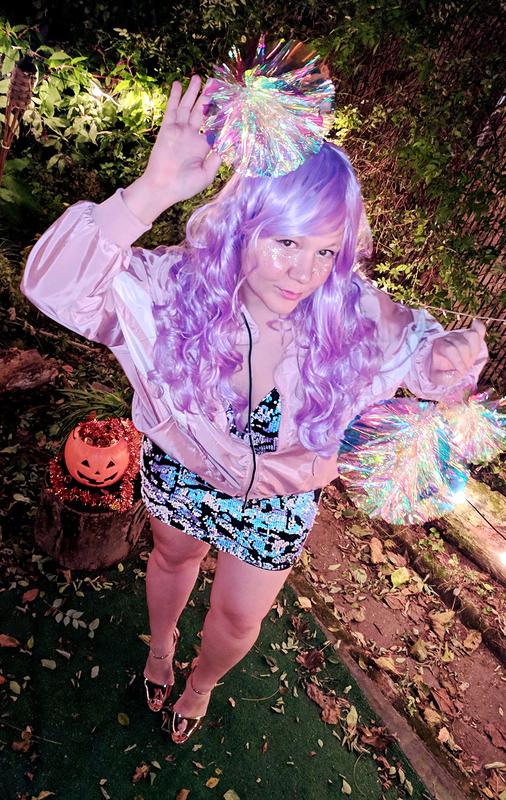 I put this costume together by dragging all of the pastel pinks from my closet and seeing which would look the most tonal. I ended up using rose gold, mauve, and pure pastel pink to pull the look off. I topped it off with my favorite wool hat and new FILA tote. Finally, I had some pink press-on nails sitting around and I picked up what should have been a matte pink lipstick. It looks more like a rosy-magenta, though. *Only lipstick was purchased for this costume! I do happen to own a lot of pink. You might want to go tonal and dress as your favorite color. 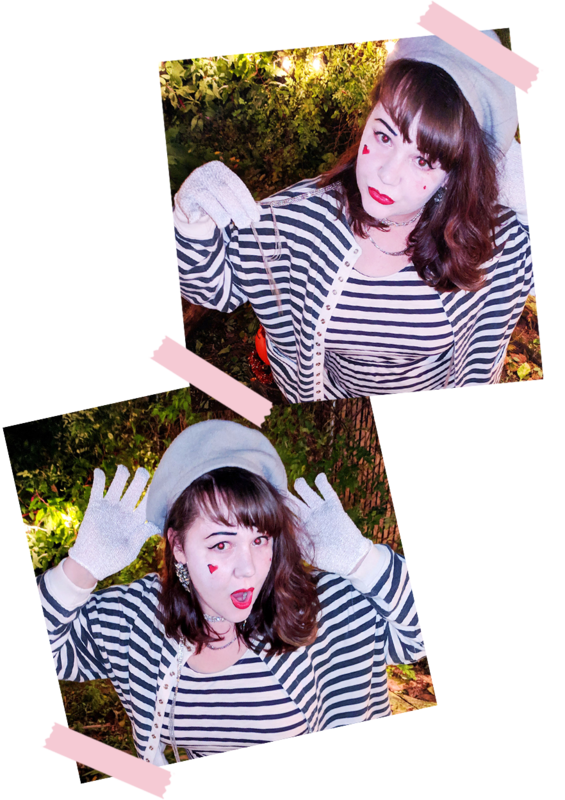 The costume: Why be a mime when you can be a boujee mime, dripping in jewels? 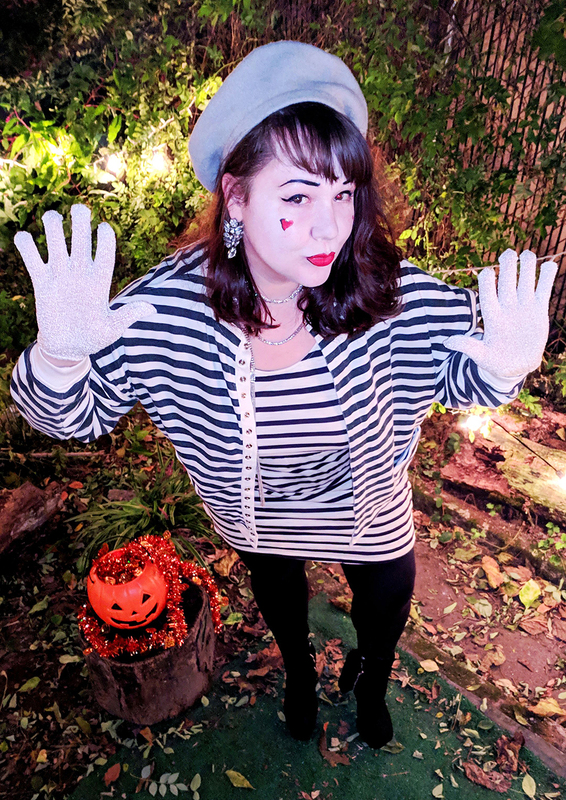 Okay, to be fair, this costume came to be because I knew I had striped clothing and white foundation from last Halloween… but didn’t have enough to make a standard mime costume. I added a twist with rhinestone costume jewelry, borrowed a beret from my roommate, and went for the bright red lip. My favorite part, though? The brows! I have transparent Scandinavian brow hair, so Halloween is when I get to live out my dreams of having insta-brows. The last piece of the puzzle was a pair of white gloves. I didn’t want to buy anything I’d never use again, so these are actually exfoliating shower gloves. 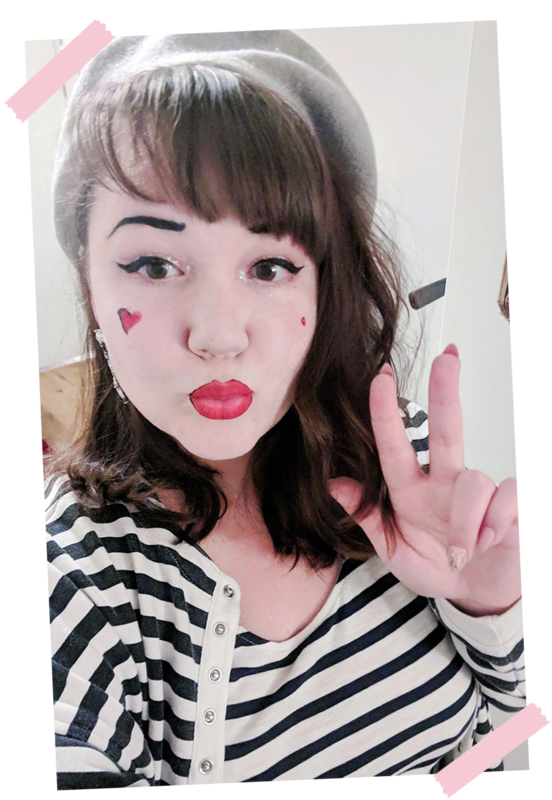 *Not bad for a total mime makeover! 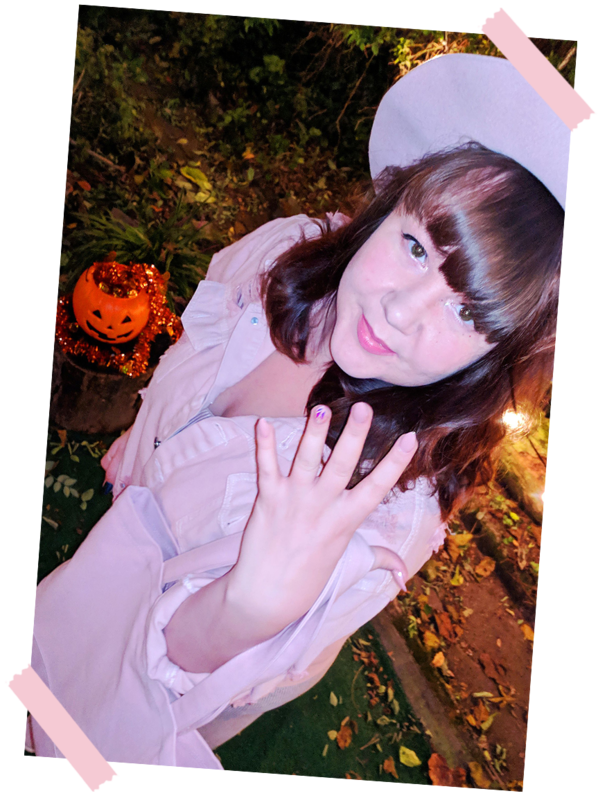 There were a few honorable mentions or costume ideas that didn’t quite come to fruition… but these were the ones I’d actually wear out on Halloween! It’s nice to know I can whip open my closet and pull out a costume anytime I need one. I hope this showed you that you can do the same! Which last minute DIY Halloween costume is your fave? Drop a comment below!